This is a Gold Box Deal so will only last for today 6/21 or until stocks last. 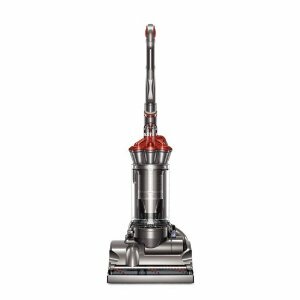 The Dyson DC27 Total Clean Refurbished is a powerful upright vacuum cleaner for all floor types. It weighs just 19.9 pounds with no compromise in durability. The quick-draw telescope reach wand extends 17 feet for high-reach cleaning, with no awkward parts to assemble. DC27 features a lifetime washable HEPA filter, making it ideal for allergy sufferers, and there are no costly bags, belts or filters to replace. It features Dyson’s patented root cyclone technology that doesn’t lose suction power as you vacuum. The cyclones capture more dirt and microscopic dust than other cyclones, and the bin empties hygienically, with the push of a button to minimize contact with dirt. “Dyson refurbishes vacuums that are returned to us by retailers or consumers. Refurbishing these machines, rather than disposing of them, means that the parts and materials are re-used instead of wasted. When a machine comes to us to be refurbished, it is first stripped down as far as necessary. Components removed from the machine that meet our high standards of quality are kept and cleaned. Most damaged or broken components are sent away for recycling. The core of the machine is thoroughly cleaned and new parts are added to replace damaged or cosmetically unacceptable parts discovered during the stripping down process”. So you get a great machine, with a warranty, at an amazing price. Couptivate: Organize Your Daily Deal Purchases in One Spot! HOT: Black & Decker Tool Set just $2 Shipped!